Geschiedenis, mogelijkheden en faciliteiten van de Zwarte Boer - Bekijk de faciliteiten en mogelijkheden van de Zwarte Boer! In the oldest part of Hotel-Restaurant "De Zwarte Boer" we bid you welcome for a cup of coffee with homemade pastries, a tasty lunch from our lunch menu or a tantalising dinner. "De Gelagkamer" dates from the early years of the 17th century. Enjoy a crackling fire in our beautiful fireplace with original tile tableau of King William the First and his wife Anna Paulowna. During the extensive restoration we found the original floor which was hidden under a wooden layer and carpet. The floor has now been fully restored. The old wardrobe and bedstead, date from the time when only the wealthy coachmen could afford an overnight stay. Did you know that the bedstead was not so small because the people were once much shorter ?? They slept half sitting because they feared that the blood would rise to their head. Fine Dining Restaurant: "De Zwarte Boer"
This part of "De Zwarte Boer" dates from 1855. A special detail is that “De Deel” is built in 1855 with the bricks that were released during the demolition of the “Oude Huis Leuvenum" (old manor of the Leuvenum estate) in 1854. 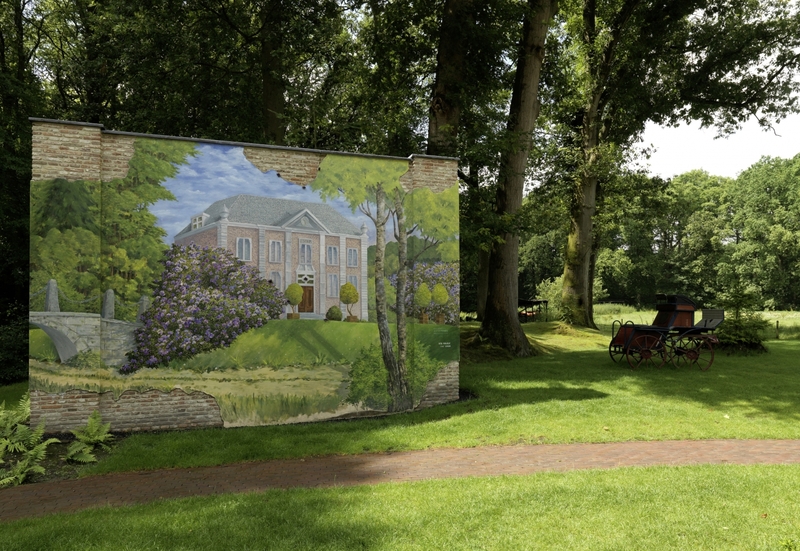 On the border of our terrace we have realized a beautiful work of art with a lifelike painting of this old manor which was located in the forests behind our hotel. When you walk over the small bridge (behind the hotel) into the forest, you can still see the old castle moat. The foundation of the castle is still intact. If you close your eyes here you can feel the mystical atmosphere and allure of old times. "De Deel" is the perfect location for an intimate dinner, wedding, anniversary, reception or business meeting up to 55 people. "De Deel" has its own bar and terrace and features all audio/visual equipment. We can partly cover the terrace allowing us to arrange events for groups up to 150 people. Our Hotel-Restaurant is an official wedding location for the town of Ermelo. Within walking distance you will find estate Ullerberg. The Ullerberg is a very special location with one of the rarest private golf courses of The Netherlands. On the unique nine-holes natural moor course, the silence is deafening. Playing golf on estate The Ullerberg is experiencing how golf was played decades ago. For more information click the following link www.ullerberg.com or send your mail to info@ullerberg.com. Do you prefer contact by telephone? Please call mrs. Erlandine Heering on +31 6-22242103. A great way to explore the beautiful environment is by Segway. A Segway is a self-balancing electric transportation device which moves when the driver leans forward or backwards. Aside from a standard Segway you can book an “Off Road” Segway. Great during your stay, during your conference-break or combined with lunch or dinner. Should wish more information, please click on www.segway-veluwe.nl. Looking for an original gift? We would love to pamper your loved ones, friends, colleagues or business associates! You can order a personalized gift voucher with amount, hotelpackage and/or dinner. Our hotel guests can enjoy a fresh cup of coffee or a (alcoholic) drink with a snack in one of the six comfortable chairs near the old fashioned gas fire in “De Heerenkamer”. In our bookshelves you will find magazines, books, CDs and DVDs. Our hotel offers six very tastefully furnished and luxurious rooms, one suite and one apartment. All with its own identity. Our Spring, Summer, Fall, Winter, East and West room are all different. Even the bathrooms are different from each other. What they do have in common are Bang & Olufsen TV and Audio (wireless) internet, electrically adjustable box spring beds of Royal Auping, sinks of Belgian bluestone, steam cabins, and amenities from Rituals. Our Suite and Spring Room are also equipped with the most luxurious version of the Geberit AquaClean Mera Comfort Toilet. Need a little support getting to your comfortable room? Even though we only have 8 rooms we have had an elevator installed. For all reservations and additional information, please don't hestitate to call “De Zwarte Boer” direct on tel. +31 577 407395. We close no later than 00:30hrs to ensure the good night’s rest of our hotel guests.